Simeon Yetarian (Armenian: Սիմեոն Յետարիան) is a character in the HD Universe who appears as a minor character in Grand Theft Auto V and as a supporting character in Grand Theft Auto Online. Simeon Yetarian is, in 2013, the owner of the Premium Deluxe Motorsport automobile dealership at the corner of Adam's Apple Blvd and Power St in Pillbox Hill and of a garage in Terminal, both in Los Santos. He frequently convinces and/or pressurises his customers into purchasing cars with repayment and interest rates that they will be unable to afford in order to reposess the vehicles at a later date. When confronted by his customers, he calls them a racist in an attempt to escape their demands for refunds and is also known to completely ignore certain customers, as with Owen Yates who tricks Simeon into accepting a Lifeinvader friend request to complain to him again. When a customer defaults on one repayment, Simeon has the vehicle repossessed. Simeon had put himself forward for a number of 'hero of the community' awards but had never won, declaring the panel to be racist. Despite his claims that his customers are racists, Simeon himself dislikes the idea of interracial marriage. In 2013, Simeon hires Franklin Clinton and Lamar Davis to his repossession team to work with his nephew Sacha and Anak Horozian. The two become a successful team for Simeon who also briefly hires an unnamed friend of Lamar's to do some repossession work for him as a way of repaying him for a free upgrade to their car at Los Santos Customs. He also tasks the unnamed friend(s) to acquire certain vehicles for him to use in his showroom. Later in the year, Franklin and Lamar are seen repossessing two sports cars. When the two return to the dealership, they see Simeon attempting to sell a yellow BeeJay XL to Jimmy De Santa. Simeon then has the two repossess a motorcycle from Los Santos Vagos gang member Esteban Jimenez, after naming Franklin as the 'Employee of the Month'. Simeon's relationship with the pair is dented when Lamar takes the motorcycle for himself with Simeon accusing Franklin of stealing the motorcycle. To earn his trust back, Simeon tells Franklin to repossess the BeeJay XL purchased by Jimmy De Santa before returning to his customer. Franklin is able to repossess the vehicle by breaking into the De Santa house but, on the journey back is surprised to find Jimmy's father Michael hiding on the back seat. Michael then forces Franklin, at gun point, to drive the vehicle into the Premium Deluxe Motorsport showroom. Franklin then attempts to explain his actions but is fired by Simeon. Simeon is then beaten up by an angry Michael. After this incident, Simeon also fires Lamar, replaces Franklin's 'Employee of the Month' picture with one of himself and hires a new repossession team, which he claims are learning quickly. 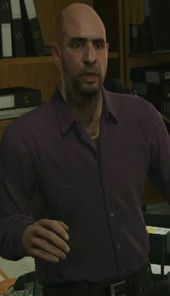 Simeon can then have another encounter with either Franklin or Michael, before the player begins the Mr. Philips mission, at his car dealership. During this encounter, Simeon is confronted but has back up from two Armenians gangsters. The player can then choose to kill or spare both Simeon and his back up. Regardless of the players choice, Simeon survives and later goes on a date with Barbara Watkins who pays for their first date and is then bombarded by text messages from Simeon, asking him to leave her alone. He also has a 'bum' urinate on one of his air dancer promotional signs. Simeon has eighty-four Lifeinvader friends with two of them being family members. Simeon has eight different job titles at the dealership. The original name for Simeon Yetarian was Harut Vartanyan. Simeon Yetarian during the Gameplay trailer. This page was last modified on 11 December 2014, at 19:04.